A reporter of Vice news website, who was allegedly kept in captivity by pro-Russia forces, recounts the developments in Ukraine's eastern city of Slovyansk. VICE NewsVICE News reporter Simon Ostrovsky tells the full story of his abduction and captivity in eastern Ukraine by pro-Russia forces. Sergei Ryabkov, Russian deputy foreign minister, said on Tuesday there was no reason to fear Moscow would try to take over southeastern Ukraine following its annexation of Crimea, Interfax news agency reported. 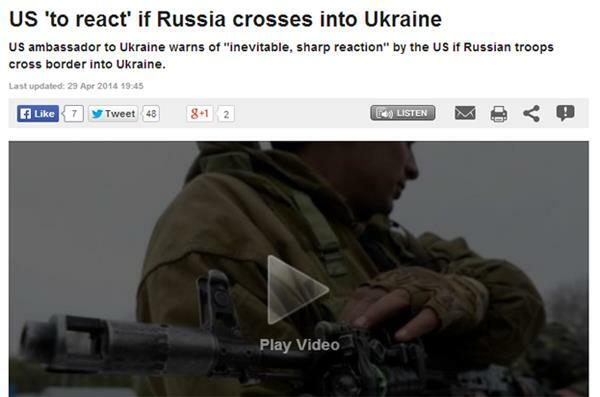 We are - and I underscore this - not at all inclined to repeat the so-called Crimea scenario in southeastern Ukraine. There are no grounds to fear this. The self-declared mayor of a separatist-held town in eastern Ukraine said on Tuesday he would discuss the release of detained military observers with the West only if the European Union dropped sanctions against rebel leaders. Vyacheslav Ponomaryov, the de facto mayor of Slovyansk, told Interfax news agency the imposition of visa bans and asset freezes by the European Union against Denis Pushilin, leader of the self-styled People's Republic of Donetsk, and Andrei Purgin, another leader in the eastern region, "was not conducive to dialogue". The six observers were in Ukraine under the auspices of the Organization for Security and Cooperation in Europe (OSCE), a democracy watchdog. They were detained last week after separatists said they had found a Ukrainian spy with them. We will resume dialogue on the status of the prisoners of war only when the European Union rejects these sanctions. If they fail to remove the sanctions, then we will block access for EU representatives, and they won't be able to get to us. I will remind my guests from the OSCE about this. Hundreds of pro-Russian separatists have stormed the regional government headquarters in Ukraine's eastern city of Luhansk, according to the Ukrainian government. The country's acting president, Oleksandr Turchynov, has demanded the dismissal of police chiefs in Donetsk and Luhansk, saying the police in the east have not fulfilled their duties. Walking out the human corridor by police HQ in #Lugansk - youtube.com/watch?v=vUfSkC… - atmos friendly but firm in demand police leave. We have an update on Vladimir Putin's comments about whether or not Russia will impose counter sanctions on the West. While Putin said he did not see a need for counter sanctions, he also said that he might reconsider the participation of Western companies in his country's economy, including energy projects, if sanctions continued. If something like that continues, we will of course have to think about who is working in the key sectors of the Russian economy, including the energy sector, and how. Pro-Russian groups are gradually extending their control in eastern Ukraine. With hopes of holding a referendum in May, the gap between pro-Kremlin and Ukrainian patriots seems to be widening. Al Jazeera's Barnaby Phillips reports from Donetsk, eastern Ukraine. Update: on a day when pro-Russian groups took over the regional headquarters in the eastern city of Luhansk, and the US and EU announced new sanctions on Russia for its role in Ukraine's crisis, the US also issued a strong warning to Russia. The United States Department of Defense is looking at additional support measures for its eastern European NATO allies increasingly worried over Russia's military actions in Ukraine, a spokesman said Tuesday. In particular, the US is planning to beef up training exercises planned for June in the Baltic states, as Moscow hit back at what it called the West's "Iron Curtain" sanctions, according to Rear Admiral John Kirby. The Pentagon plans to make the land and sea exercises "more robust, using additional assets that are already in Europe; perhaps more aircraft, maybe more ships", Kirby said. The US vice president, Joe Biden, has met the Latvian prime minister, Laimdota Straujuma, at the White House. In the meeting, Biden underscored Washington's "ironclad commitment" to the collective defence of its NATO allies, the White House said in a statement. "The two leaders discussed the critical importance of bolstering Europe's energy security through coordinated actions among European states." it added. 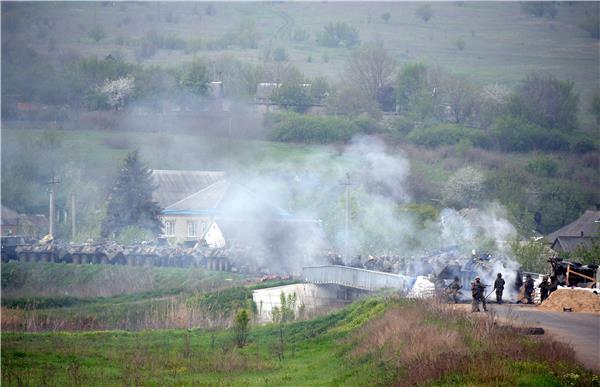 AFP have published an undated round-up of what has happened in the east of Ukraine. Slovyansk The centre of rebel activity and the scene of much of the reported violence and abductions. On April 12, pro-Russian gunmen seized the police building in this town of an estimated 140,000 people, raiding its arsenal. They then took over the town hall and the SBU security building the same day. Donetsk This city of one million people is the hub of the region, which includes Slavyansk, and is the heart of what rebels call their "Donetsk Republic". The regional administrative building was seized on April 6 and the city hall on April 16. Luhansk This city of 465,000 and the regional heart of Luhansk region, is proclaiming itself the core of a self-styled "Luhansk Republic". Its SBU security building was taken on April 6 by about 1,000 pro-Russian protesters. On April 29, a crowd of hundreds took over the regional administrative building and later, with gunmen at their head, the regional police headquarters. Kramatorsk Next to Slavyansk, town hall taken over on April 12 during a rally by more than 1,000 pro-Russians. On April 15, a bomb cleared the building, but pro-Russians then took over the nearby SBU building. On April 21, pro-Russians forcibly retook the town hall. 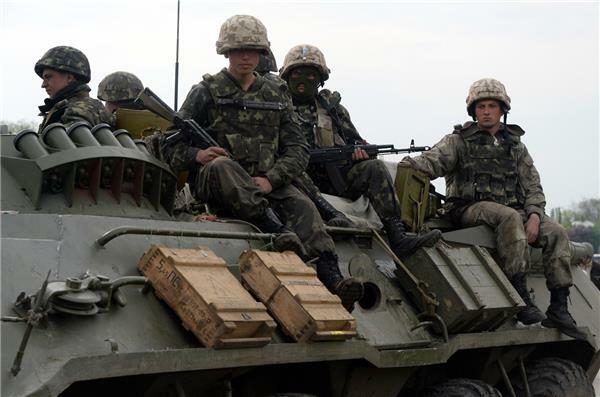 A Ukraine military base lies outside the town and has fended off several attacks. Horlivka Population of 260,000. Had a local police building seized on April 14. On April 30, separitists grabbed its regional police department and the town hall. 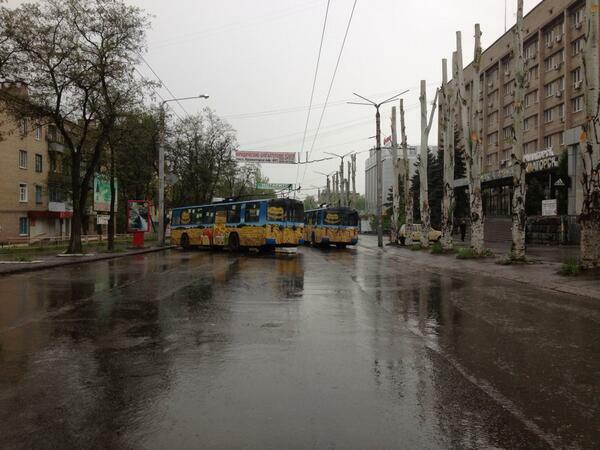 Mariupol Port city taken back from pro-Moscow rebels on April 25. While police control the town hall, a few pro-Russian protesters remain inside. Other towns where government buildings seized: Makiivka, Artemivsk, Yenakieve, Khartsyzk, Zhdanivka,Kirovske, Torez, Kostyantynivka, and Pervomaisk. Pro-Russian activists attach St George ribbons, their symbol, to the uniform of a police official as they try to convince the police not to confront the rebels in Luhansk on Tuesday. 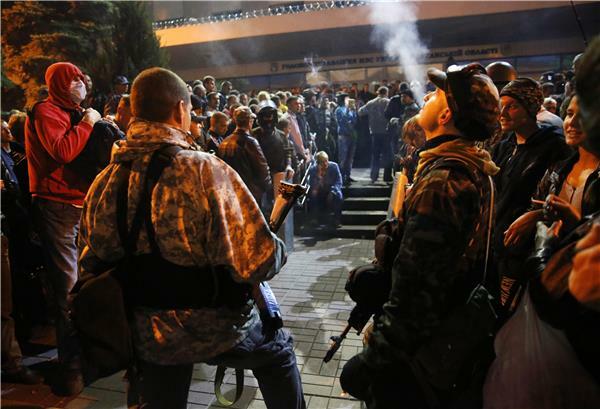 Pro-Russian rebels corner police in Luhansk before storming the local administration building on Tuesday. A leader of the self-declared Donetsk People's Republic said Wednesday that the eastern Ukraine region will not take part in presidential polls, as he traveled to Russia on a apparent mission to seek support. "Presidential polls have been called by the illegitimate authorities and therefore they are illegitimate," Denis Pushilin, one of the leaders of the self-declared Donetsk Republic, told reporters in Moscow. The IMF has said that the Ukraine crisis, and especially sanctions, have pushed Russia into recession. Some politicians say the crisis could spur Russia to seek new economic partners, such as China. Ukraine’s IMF loans are subject to demands that Ukraine cuts subsidies for fuel, reduces its large deficit, controls pay rises, reduces corruption, and reforms its banking system. Russia's Foreign Minister Sergey Lavrov called on Thursday for talks between Kiev and pro-Russian separatists in south-eastern Ukraine under the aegis of the Organisation for Security and Cooperation in Europe. 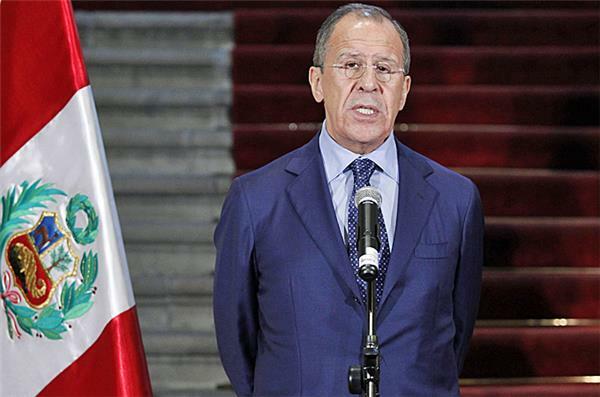 "Russia believes that such a dialogue could be arranged between the authorities in Kiev and their opponents in other regions of the country under the aegis of the Organisation for Security and Cooperation in Europe," Lavrov told Rossiya-24 TV during a visit to Peru. A few thousand pro-Russian protesters gathered in Lenin Square in Donetsk on Thursday, according to Al Jazeera's Hoda Abdel Hamid. German Chancellor Angela Merkel on Sunday asked the Russian president, Vladimir Putin, to help free a team of OSCE observers that had been captured in Ukraine, the Kremlin said. "Angela Merkel made a request to help facilitate the release of military observers from a number of European countries including Germany that had been detained in the southeast of Ukraine," the Kremlin said following phone talks between the two leaders. "Both sides noted the importance of using the mediating potential of the OSCE across Ukraine to the maximum degree." Ukraine is bringing back military conscription with immediate effect to deal with a spreading pro-Moscow insurgency in its east, according to a decree issued on Thursday by interim president Oleksandr Turchynov. The measure was being taken "given the deteriorating situation in the east and the south ... the rising force of armed pro-Russian units and the taking of public administration buildings ... which threaten territorial integrity," Turchynov's office said in a statement. Ukraine's parliament voted on April 17 to "recommend to the acting president to restart conscription into the Ukraine armed forces without delay" in order to "bolster Ukraine's defence capabilities in connection with aggression from the Russian Federation". Russia staged a huge May Day parade on Moscow's Red Square for the first time since the Soviet era, with workers holding banners proclaiming support for President Vladimir Putin after the seizure of territory from neighbouring Ukraine. Thousands of trade unionists marched with Russian flags on Thursday and those of Putin's ruling United Russia party onto the giant square beneath the Kremlin walls, past the red granite mausoleum of Soviet state founder Vladimir Lenin. Many banners displayed traditional slogans for the annual workers' holiday, such as "Peace, Labour, May". But others were more directly political, alluding to the crisis in Ukraine where Russia's annexation of Crimea in March precipitated the biggest confrontation with the West since the Cold War. The Ukrainian army has reportedly begun a special operation against pro-autonomy activists in the eastern town of Slavyansk early Friday morning, as air raid sirens went off and gunfire was heard. Slovyank self-defense forces told RIA Novosti that the Ukrainian military has attacked several positions. 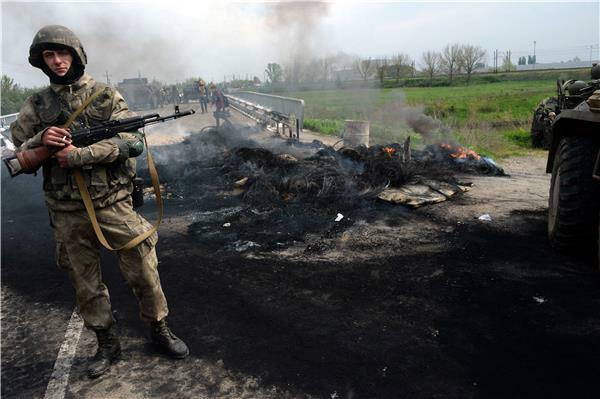 The separatists referred to the attack as a "large-scale operation", according to Reuters. A Reuters photographer said he saw a military helicopter open fire on the outskirts of the town and a reporter heard gunfire. The Associated Press news agency reported Vyacheslav Ponomarev, the separatist-appointed mayor of Slovyansk, as saying his forces had shot down two helicopters and taken one pilot hostage. That information could not be confirmed independently. Al Jazeera's Jonah Hull, reporting from Donetsk, said "a large scale operation is under way to retake Slovyansk, which was seized three weeks ago in a wave of activity by pro-Russians. 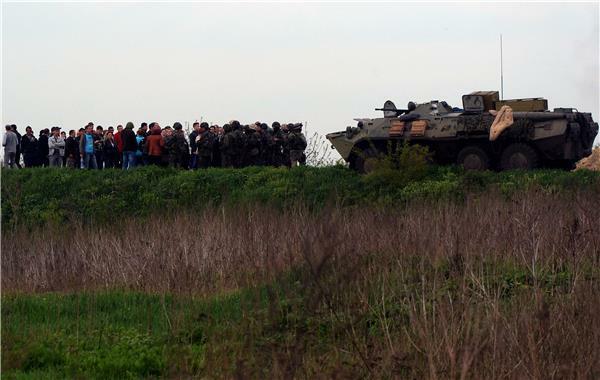 "The area was surrounded twice in the past 10 days by Ukrainian forces. "At dawn the army moved in and there is a serious ratcheting up of tension and it is a very troubling development." "On social media we hear that about eight armoured personnel vehicles were seen heading up to the city, one or two helicopters were seen firing down on the separatists checkpoints that were set up at the perimeter of Slovyansk and there's a report that one of those helicopters may have been shot down, and the occupants were taken prisoner. "None of it I can independently verify but in the words of the people of Slovyansk, a large scale operation is under way to try to retake the city." NATO official: Russian moves in Ukraine pose 'grave challenge' to global security system. Our correspondent Jonah Hull states that Russian TV pictures have shown a badly injured man purported to be the pilot of a downed helicopter, being taken prisoner in Slovyansk. Al Jazeera has seen a video of the incident, uploaded on youtube, but feel identification issues prevent us from posting the link. Our correspondent Jonah Hull added that the city of Slovyansk appears calm suggesting that activity is happening in the north of the country. Kiev has not commented yet. As usual, word from Slavyansk appears to be "something happened and its not clear what." Ukrainian Interior Minister Arsen Avakov said on Friday a pilot had been killed and others wounded after pro-Russian separatists in the eastern town of Slaviansk used anti-aircraft missiles against Kiev's forces. On Facebook, Avakov posted: "Against Ukraine's special forces, terrorists used heavy artillery, including grenade launchers and portable anti-aircraft missile launchers. One pilot is dead and there are wounded." He accused the separatists of employing professional mercenaries. AFP has pictures of today's events in Slovyansk. Ukrainian soldiers take position at a checkpoint they seized in the early morning in the village of Andreevka, 7km from the centre of Slovyansk. A helicopter lands near a tank at a checkpoint seized in the early morning in Andreevka. A Ukrainian soldier stands guard. 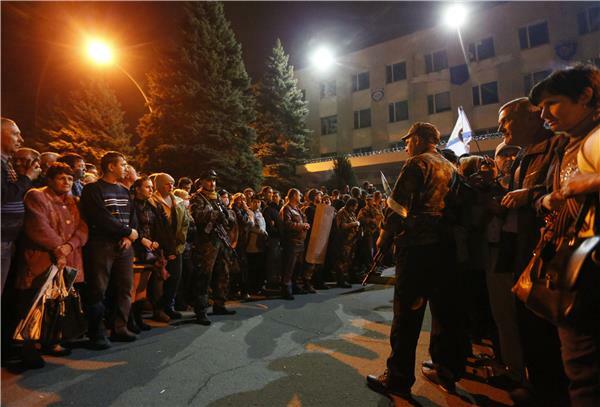 Residents gather to speak to Ukrainian soldiers in Andreevka. 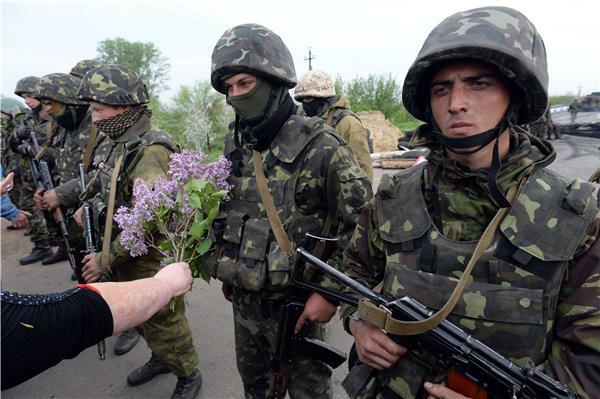 A resident offers flowers to Ukrainian soldiers. 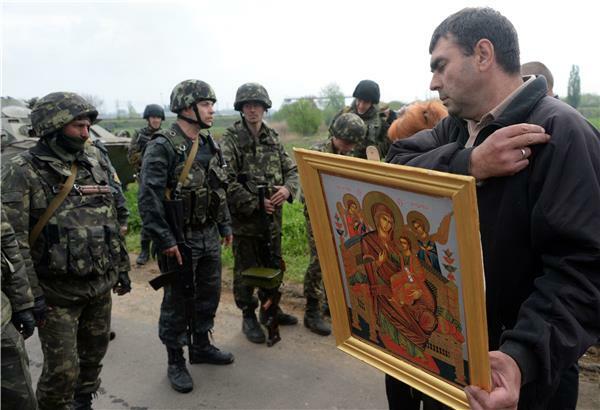 An Andreevka resident holding a religious icon crosses himself next to Ukrainian soldiers. Young soldiers aboard an APC outside Andreevka. 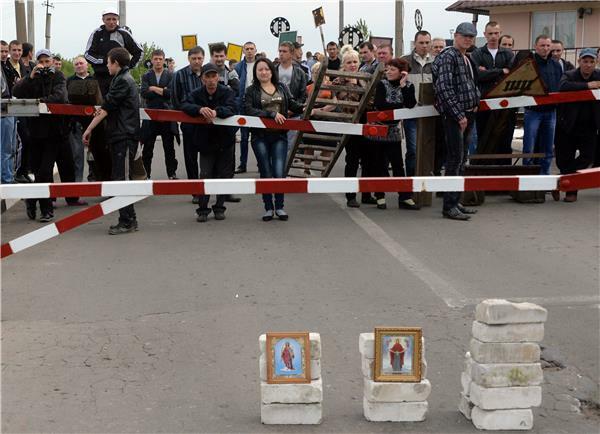 Religious icons are placed on bricks as residents gather in Andreeva. RUSSIAN FOREIGN MINISTRY DEMANDS WEST TO GIVE UP ITS "DESTRUCTIVE" POLICY IN UKRAINE, URGES KIEV TO IMMEDIATELY STOP "PUNITIVE OPERATION"
The European Union said on Friday it was watching events in eastern Ukraine with growing concern, calling on pro-Russian separatists to leave occupied buildings and release people they were holding. "We are following with growing concern the events in eastern Ukraine," Maja Kocijancic, a spokeswoman for EU foreign policy chief Catherine Ashton, told reporters, according to Reuters. 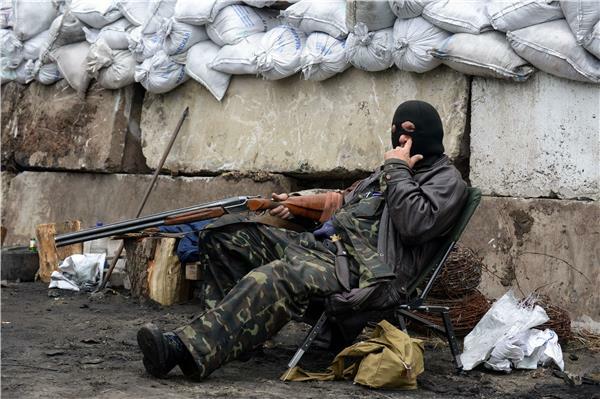 The EU called for an end to all "illegal actions" by armed separatist groups. "Occupied buildings need to be vacated, all persons illegally detained need to be released, including the OSCE military observers," she said. Reuters is reporting that Russian President Vladimir Putin's spokesman said on Friday that Kiev would be held responsible "first of all by its people" for its decision to launch a "punitive operation" in south-east Ukraine. Kremlin spokesman Dmitry Peskov, speaking on Rossiya 24 television, called on Europe and the United States to give their assessment of the situation in the area, where "aviation is being used against the population" and urged Kiev to think again about its actions, according to the report. Pro-Russian separatists left the prosecutor's office and television centre in Ukraine's eastern city of Luhansk on Friday, the Interior Ministry said. "The (prosecutor's) office was freed today thanks to negotiations between the local authorities and people who had seized the building," the ministry said in a statement, according to Reuters. It said in another report that separatists had also left the television centre. Both were seized on Tuesday. Demonstration for "unified Ukraine" turns violent in Odessa. Espresso TV live stream shows rocks being thrown at pro-Russia activists. The station claims Ukrainian march has been attacked by pro-Russians and the demonstrators are reacting. Allegedly up to five people were injured. "Chernomorets FC and Metalist FC 'ultras' fans joined Odessa's pro-Maidan activists for a joint United Ukraine march after their game in Odessa. The march was attacked by a group of Odessa's Guard (pro-Russian) members. Now Odessa's Guard barricaded themselves in a small street and is under continuous heavy attack. Five injured (according to Hromadske TV broadcast) and one dead (Odessa Live and Espreso TV broadcast)." Update: Reuters news agency says local police confirmed in a statement the death of one man in the clashes. The man had been shot in the chest, puncturing his left lung. He died before the ambulance reached him.